If you’ve never handled a Kyocera Ceramic Knife, you don’t know what you’re missing. When it comes to effortlessly slicing fruits, vegetables, and boneless meats, ceramic knives are in a class of their own. Of course, for most home cooks, a ceramic knife will not replace your tried and true steel chef’s knife and paring knife for some tasks, but they sure do make an excellent addition to your collection. Kyocera‘s ceramic knives are made from a high-tech ceramic recipe called zirconium oxide. What makes Kyocera stand out from other ceramic knives is the super-fineness of the processed raw materials and the amount of compression and heat that sinters them into an extremely dense final product. So you get knives take a finer edge and are much more chip resistant than the competition. 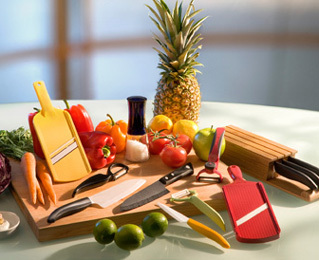 Kyocera also produces mandolin slicers and vegetable peelers with the same high quality ceramic blade. We recommend these products time and time again to our customers who desire great quality tools that are both functional and easy to use.